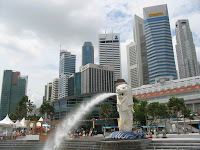 The Merlion, a half-fish, half-lion beast, is a fitting symbol of Singapore. The "Singa" or lion represents the animal that a Sumatran prince saw which resembled a lion, and the fish is a tribute to Singapore's history as "Temasek", the ancient sea town. Singlish, a Singaporean patois mixing English with the odd phrase of Chinese, Malay and even Tamil, has two entries - lah and sinseh - in the online version of the Oxford English Dictionary. Although English is the official working language and the most widely used language in Singapore, the national anthem 'Majulah Singapura' is actually sung in Malay. The flying fox, the world's largest bat with a wingspan of up to 1.5 metres, can be found on Pulau Ubin, one of the islands off mainland Singapore. The world's highest man-made waterfall, standing at 30 metres, is located at the Jurong BirdPark. The buildings of Suntec City have been built in the shape of a palm of a hand symbolising good "feng shui". In 2003, Singapore's Changi Airport won the award for "Best Airport Worldwide" for the 16th consecutive year from the UK/Europe edition of the Business Traveller magazine. The first Singaporean film to be shown at the Cannes Film Festival was director Eric Khoo's 12 Storeys in 1997. Singapore's best showing in the Olympic Games: Silver medal won by weightlifter Tan Howe Liang in Rome (1960) followed by a Silver Medal won by the women’s table tennis team in Beijing (2008).